Is Sony making a sensor/lens combo for smartphones? 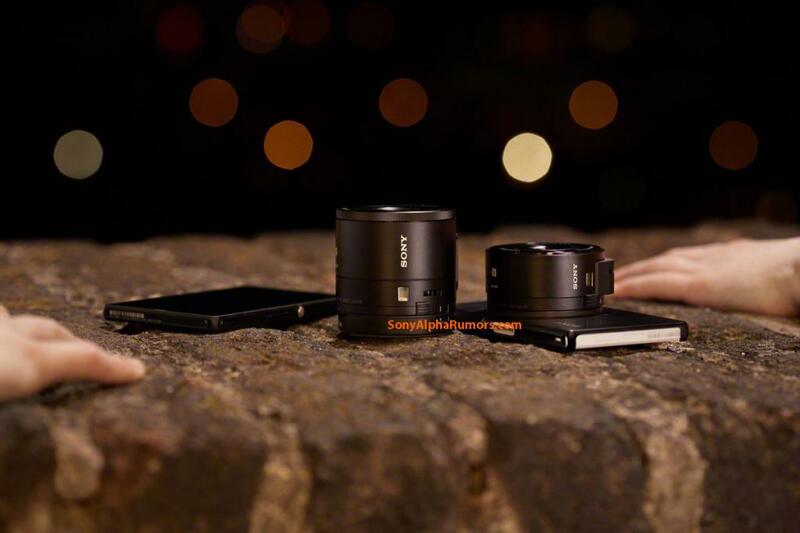 SonyAlpha Rumors has posted new photos of two supposedly soon-to-be-released Sony interchangeable sensor/lenses for smartphones, which, if true, would provide a serious boost for mobile photographers. According to the site, there will be two versions of these unusual smartphone photo accessories (for lack of a better term): the DSC-QX10 and the DSC-QX100. Both are said to have a built-in sensor, Bionz processor, WiFi, NFC and an SD card slot and can be magnetically attached to both iOS and Android devices. Communication between the "lens-camera" (a SonyAlpha Rumors term) and the smartphone is via WiFi. Any functions would be controlled via the smartphone. SonyAlpha Rumors speculates, rather emphatically, that one model will feature the same sensor and lens as the RX100MII, a camera that is built around a 1-inch Exmor CMOS sensor and is equipped with a 3.6x Zeiss lens. 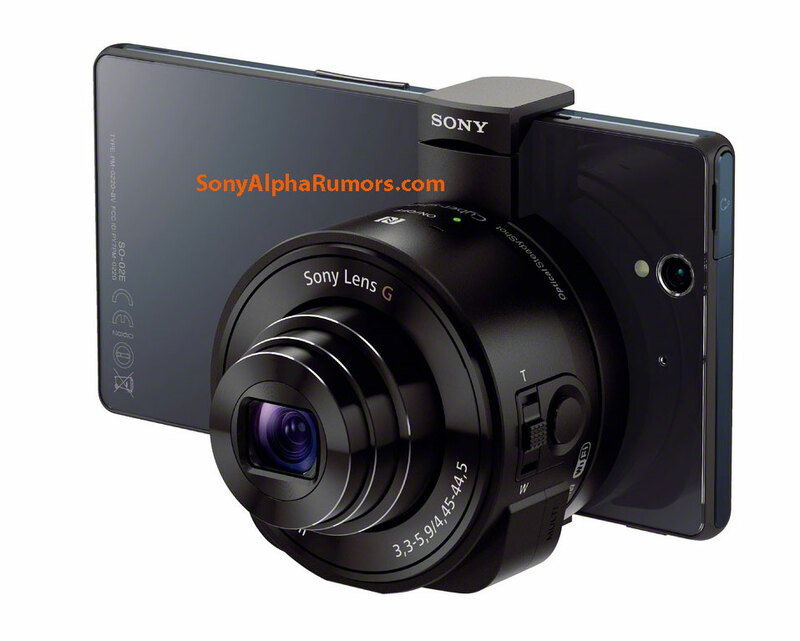 The second model, according to SonyAlpha Rumors, is based on the Sony WX150's 1/2.3 inch CMOS sensor and 10x zoom. This seems kind of odd, though, given that the WX150 is about 1 1/2 years old. SonyAlpha Rumors is reporting that the smartphone accessory fits both iOS and Android devices. With increasing chatter about the upcoming Honami announcement (is this really a photo shot with the Honami?) and these lenses, we may have some interesting products to write about in the near future. sony knows this is the future of cameras, so they might as well take the lead. does it have a battery? where is it? - Weather sealing or even Water Proofing. - Fast Primes, 28, 35, or 50. (maybe 40). - Common thread size for filters, Hoods etc. - Macro, Unless it makes it way too big. "Credit where's credit's due," I think we have Minolta to thank for the design. don't care what other people think, if the 1" sensor version is under 500, I am getting it. Otherwise I will wait for a price drop. A perfect tool for Spiderman! Put several WiFi lenses around and control them via a smartphone or a huge tablet then take a series of snaps her and there. A peeping-t om could attach this to a radio controlled car and see what's underneath. One could hold it in hand and take shots down, up, side, back, diagonally or any direction. The possibilities that's comes to my feeble mind are endless think about TRULY creative people extending this! At First, did not think this rumor was a good idea. But, as it looks like it is a Real product, I am starting to see how this could be a very useful Camera/lens for any Smartphone. The "any" part opens up markets. and that the Lens/sensor is "Separate" from your viewing device, think about the possibility for a second. Than maybe water resistant? Maybe even a GoPRO kind of thing, but with remote viewing and Storage. Basically using your own Smartphone connections and "APPS" and LCD. (everyone is familiar with and use) All it is doing is providing a Better Lens and Sensor, for Better Image Quality. If you believe that the "LENS" is more important than the camera, as I do. This just might end up being a great idea! No I don't wanna be called like a dork using my smartphone for photography. I'd rather carry my trusted superzoom or travelzoom cam or premium compact camera like X20 or the slimmer RX100. I don’t get it; the smartphone is already so thin. Attach a large lensor onion on it, means, the lensor must be carried around somewhere, in a bag I presume, as a delicate, large size onion. If one has a smartphone, and an RX100, the whole 2-piece combo is easier and less fragile to carry than this 2-piece combo, and — hey! — the lens in RX100 can hide itself inside the RX100 body. Plus, the RX100 body is already better designed for shooting than a smartphone. And no one is carrying a bulging onion hidden in the bag. At Sony, I wonder who is using family's brain cell at the moment? RX100 lacks apps and a SIM card with a data plan. It is easier to optically enable a user's existing smartphone, than to outfit a camera with such connectivity such that it works at no extra cost to the user. It's all about the connectivity / immediacy. Users want to share / upload the photos right away. Age of the instagram. Sony looks to gear up for how photos will be taken - not just for how they used to be taken. "If one has a smartphone, and an RX100, the whole 2-piece combo is easier and less fragile to carry than this 2-piece combo,"
"This package would be even easier (and cheaper) as the lens-camera is smaller than RX100"
... until you have to pull it out, clip it on, turn it on, pair it, possibly switch on the app, frame, shoot, unclip it, turn it off, tuck it away. repeat. Or you can just pull out an RX100, switch it on, frame, shoot, tuck it away. The RX100M2 has wifi and is able to connect to most smartphones, negating the need for a SIM card. Not sure of the remote viewfinder function, but there's is an on-phone shutter release function. Not saying how practical it is, but you'll save a step as the application will most likely launch automatically if your smartphone has NFC. If you are going to take that thing with you why not a take a decent compact ? Because you always have the phone with you anyway and the lens is smaller than a compact. I'd better buying a Nokia 808 or a Lumia 1020 (or maybe a Lumia 1120 when this peripheral comes to the market). Seems like a good fit for octa copters. I love the fact that this article comes at the same time as the Lytro CEO announcing layoffs et al. Sony is still flinging dung at the walls to see what sticks. This is going to bounce right off the wall and hit them in the face. For me this is really appealing. I shoot a lot with my phone and its a hussle because of the lack of any real control. Imagine an attachable pancake to the great display you already have in your pocket anyway. This is the future. What your saying makes no sense ? They aren't the same at all .. And sooner or later the compact camera is going to go away .. They're the same in that they're sophisticated solutions to problems no one had. @ liquid ... Bingo on the last comment. Too much technology attached in the device making it bigger and more expensive than necessary. So, if Sony thinks that even a tiny sensored 10x Zoom camera is a worthy upgrade to your smartphone camera, then to my mind this is not innovation but a big step back. The "tiny sensor" (still bigger than cell phones) has 10x optical zoom (25–250 mm) -- that phones don't have. And the second version has bigger 1" sensor that phones don't have. Two different versions for different needs. Another silly statement this is a large sensor for a cell phone , have even read anything about this phone. ? By ur silly statement I would say not ..
What I'm afraid of is the display lag. For example, the GoPro cameras (even the 3 BE) lag HEAVILY when an iPhone / Android / WP8 device is used as an external viewfinder via WiFi. I really hope the case will be different with these Sony minicameras. See how it works with the RX100mkII, which is basically the same guts that the big lens has. I assume the other one will work the same. A camera that's useless without a phone. A doubling of chance that you run out of battery life. It will become breathtakingly sluggisch whenever your phone decides it needs to update some app. Just put smartphone connectivity in every camera, so you can always use your phone screen as articulated viewfinder. Interesting on a technological level, uninteresting as a photography tool (for me). I wonder why they essentially make a "camera sans display". It would be interesting to see what they could do if they rather did (lens + sensor), and moved the image processing into an Android app and relying on the phone for power supply (if possible). This might slow down processing but also reduce cost and size/weight. On a personal level, I would be willing to shell out the cost only to tinker, if I could have access to RX100M2 quality image aquisition delivered raw and realtime to a simple API on my Android phone for developing my own image development and control apps using high-level languages with richly supported infrastructure, sensors and touch support in a small package. "if I could have access to RX100M2 quality image aquisition delivered raw and realtime to a simple API on my Android phone for developing my own image development and control apps using high-level languages with richly supported infrastructure, sensors and touch support in a small package." Absolutely agreed. Hope the API is any good - particularly the iOS API (the stock API is trash when it comes to manual settings / RAW access. Heck, not even exposure compensation is / in iOS7, will be allowed). The RX100MkII lens is definitely intriguing. With a good WiFi-based API and a dedicated remote-trigger input, it could be really useful anywhere one or more sync'ed remote cameras are required. Prefocus and set exposure using the API then when the action moves into the frame, hit the remote trigger button. A dedicated remote trigger input would sync multiple units together and overcome the latency inherent in a WiFi connection. Note that I would not even use the WiFi viewfinder in this application. Unfortunately, I suspect Sony focused on this as a replacement for declining point-and-shoot sales. I expect great image quality, no published API, and no remote trigger input. I don't understand what this kind of product does better than other existing devices. Operationally, I really have a hard time figuring out the competitive advantage of such a device. It's like making a smartphone less pocketable or a camera less ergonomic. are you in third world countries taking photos and needing to store them as backup right away? no, so shut up and stop pretending your needs are every other photographers' needs. Did you get, that this thing has 2 parts? I like the idea, that you can use a small camera and the display separately. It provides another gadget for the phone owner to buy, they will love it. Reusability. Why carry a large high resolution LCD screen on the back of your camera, and another large high resolution LCD screen on your phone? Performance of recent fixed lens compacts has been very good on account of being able to place a large rear element right up against the sensor. What you lose is flexibility, meaning you have to potentially carry more than one of these cameras to cover different shooting scenarios (e.g. a DP1 Merrill for wides, a DP3 Merrill for closeups and a Ricoh GR for low light). This approach would allow you to carry several "lenses" each with it's own optimised sensor, and simply use your existing phone as a screen/storage. I I remember Ricoh tried that with its interchangeable sensor/lens approach ( GXR.) It appears not to have been that successful. Brilliant! Finally the camera for the Google glasses. This thing offers endless possibilities. Hmm ... I wonder if they will make a super-dorky iPad version. An iPad version with full-size sensor and A-mount would tempt me more than the A99 as a studio camera! :-) ..... but guessing that the finder lag would be unacceptable though. This is a fresh idea to smartphone photography. 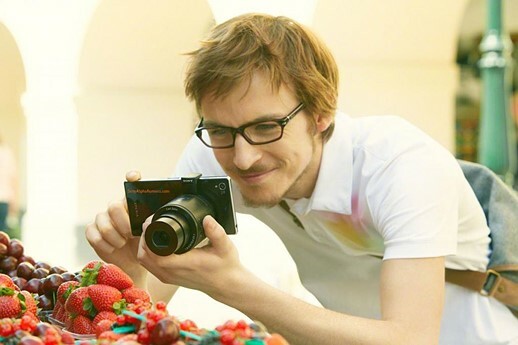 I really would like to test the 1-inch-sensor version with my XPERIA sola. The market for this kind of thing is gadget geeks ~ not photographers. If Sony publish an API for these, I'm sure Android programmers would come up with a few interesting apps . Is this for the new NFC equipped Sony smartphones? It's for any Android NFC equipped smartphones. Samsung and HTC will also work, as long as the PlayMemories app works on that device. 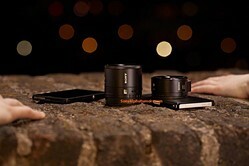 are you sure they didn't get the idea from Ricoh and does it not defeat the smallness of a phone vs. a compact camera? I like the idea but it seems like more stuff to carry. This is the kind of innovation that photography needs! Props to Sony! Hopefully others will follow. A sensor/lens module using the perpendicular lens+prism+sensor design of the Sony compact T-series cameras would be more appropriate as a strap-on. The whole body of the Sony TX66 I use is already as thin as the iPhone 4S and even narrower when looked at from the front. So thin that to mount it on a tripod I need to use a proprietary adapter. Some users could strap the module on the phone most of the time while some may just take it with them occasionally. It should take up less than half of the space normally taken by a wallet. Hmmm...pretty sure you mean...clip on? Brilliant! Nikon and Canon caught with their knickers down. I like it. It will depend on the cost and how well it actually works, but if the price is reasonable and the photos are good, it should be popular. should worth a try but I think a "large camera module" like Lumia 4080 (2 stops larger aperture lens) sounds better. think having to take off the module when not shooting is a pain in the face for most people. While a nice improvement to the photo taking abilities of a smartphone, it will suffer the same problem Mirrorless System Cameras, Point-And-Shoot, and DSLRs currently have. No one will bother taking these add-ons with them, all the time. Smartphones enjoy being "always handy" and "always close at hand". That is a HUGE part of their popularity and the reason why they are used to take more & more photos. I'm sure there is some great technology here but there's just something a little too Man From UNCLE going on. It does seem like something the Japanese would love. It's like fitting wheels to a tomato. Time consuming and totally unnecessary. Kind of like photography in general, if you think about it. I mean, do we really NEED another mind blowing shot of Antelope Canyon? photography is an art form, and it's not just about taking photos or painting landscapes of antelope canyon. i'm sure other people with a more creative mind than you will find other uses/purposes for an art form. Sage,,, just another Sony fangirl,,, zip it tubby. A new low - DPR repeating sonyalpharumorscom rumor and speculation. Except SAR has a good track record. And you know, there's a product photo of the damned thing right there, so it's a bit more than just speculation isn't it? It is speculation but the photos neither prove nor disprove the truth about the rumor. Many OEM product shots are photoshopped or even rendered in 3D, does that mean the product does not exist? Your jab about photoshop is irrelevant. "the photos neither prove nor disprove the truth about the rumor." I do 3d for a living, product visualization included. Not saying it can't be done, but people don't usually put in the effort required to create precise 3d models and then light and shade them in a photorealistic way for the sake of a gadget hoax. Given SARs track record I think the more plausible explanation is that what we're seeing is legit. a "photoshopped photo"? do you know anything about fricken photoshop, or is it just "magic" to you? nobody spends this much time making NOT one, but three to four accurate and realistic photographs of a rumored product. get real, and go learn "photoshop", you wannabee. Their sales are not doing that bad, in fact in Japan they have outdone the iphone. What if newer smart phones come out with a shape that was never considered? What happens to this gadget? Does it make a nice necklace, or key chain? You have more of a point with things like Google Glass, although - this thing will work with that as well. It works via WiFi too so you might be able to use it fairly 'standalone', i.e. dangle it round your neck or just hold it in one hand and shoot with the other. It's a pretty creative setup all things considered. Why bother? Almost as big as a Fuji x100s. You'd be better off carrying that around. So you can make phone calls and check your email on your Fuji x100s? I wonder where the batteries go. Maybe that's why the RX100 one seems so deep compared to the camera. Hope you can take the lens away from the phone and still take pictures. There was a demo video from an electronics show where the presenter did exactly that. I say, long live the smartphone with this attachment. I feel bad for them, knowing the Chicago Tribune they probably gave them iphone 3g's instead of a newer model. It wasn't that long ago that DPR said it wanted nothing to do with publishing rumors. Guess things have changed. Probably they already have a copy of this thing, but prevented from publishing anything due to NDA. Repeating rumors is probably not covered by it. Neat idea...and by "neat" I mean "stupid" and "ill-conceived". "Cameras" that can be used with a wide variety of smartphones and apps is stupid? Why? I have an rx100 with a eye-fi card I use to transmit to my ipad/iphone, but never have I thought the ergonomics would somehow be improved by duct-taping the camera t my phone and controlling it via wifi. Unless they've worked some SERIOUS magic from what is currently available anywhere else in terms of live wifi control, it's an inherently compromised setup. And it looks fugly. I hope WiFi access has feature-parity with NFC = because I wouldn't want it to be a requirement to have the "camera" attached to the phone to have full-control of the camera. NFC only initiates and pairs the phone and camera over wifi, at least on the RX Mk2. I'd assume it'd be the same.